Hey guys! As I mentioned on Instagram earlier this week, I won’t be doing a meal prep post this Sunday because I wasn’t able to cook anything all week and I want to get the recipes that have been in my head a while posted. BUT the recipes I’ve been brewing in my mind are all bowl-style meals, which are perfect for meal prep, so you’ll have a few new meal prep ideas anyway. Win-win! 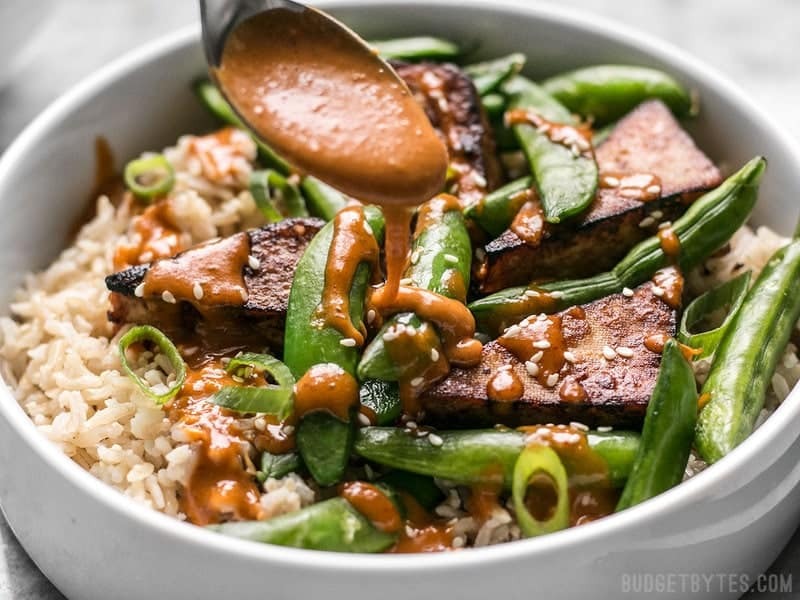 The first bowl meal idea I had are these super delish Soy Marinated Tofu Bowls with Spicy Peanut Sauce. Because this marinated tofu is fairly “wet” from soaking in the marinade, I skipped my usual cornstarch coating and simply fried them up in a non-stick skillet (the non-stick really helps when your marinade has sugar). The tofu doesn’t get crispy this way as it does with the cornstarch method, but the excess marinade caramelizes on the outside, which is really delightful. I also tested baking the marinated tofu in the oven (350ºF for about 20-25 minutes), and it was also good, but I personally preferred the pan fried version for the caramelized edges. But if you don’t like using non-stick skillets, I suggest using the baking method. What Type of Rice is Best for my Bowls? And one last note: I used a brown basmati rice that I had purchased at Aldi, but you could use just about any rice type that you like. Just make sure to follow the cooking instructions on the package for the correct cooking time and rice to water ratio, and include some salt to help make the sesame flavor pop later. 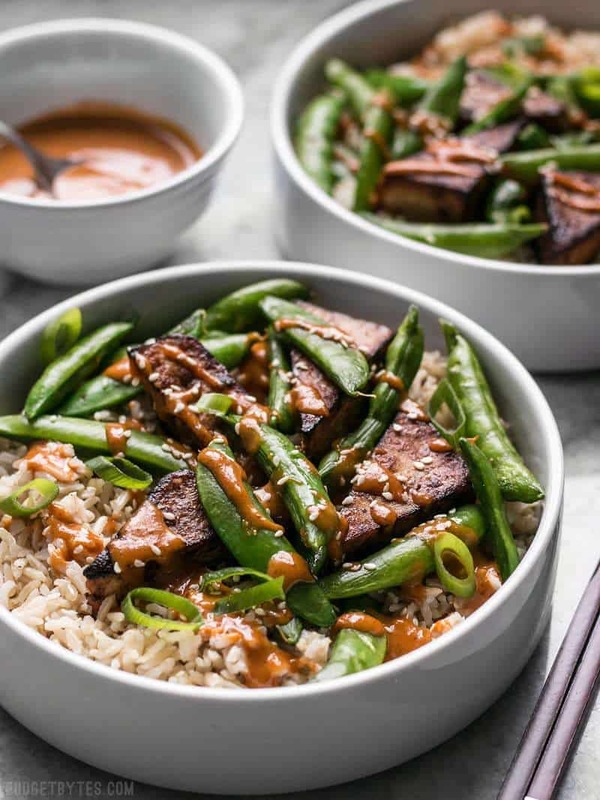 For this recipe you’ll be doing multiple things at once, between the pressing and marinating tofu, cooking the rice, and making the peanut sauce, so make sure to read through the instructions completely before beginning. 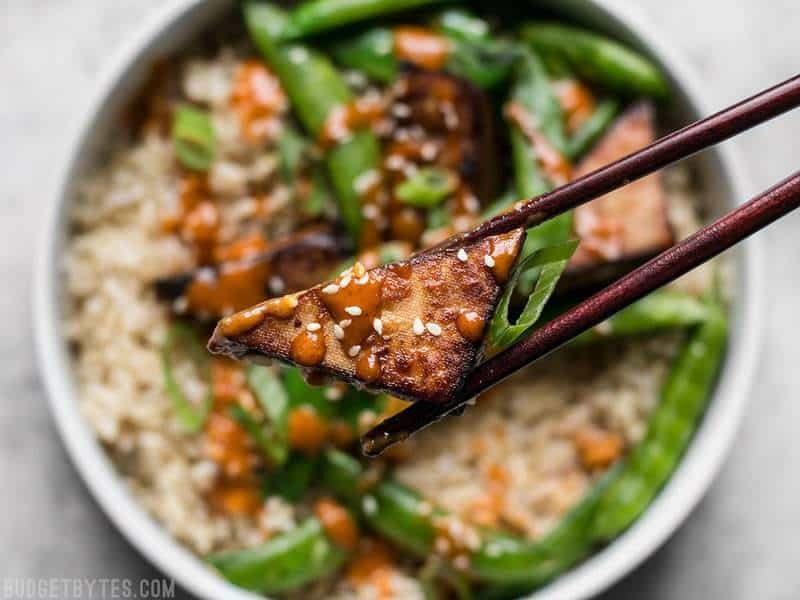 These vegan Soy Marinated Tofu Bowls are full of rich flavors and plenty of texture to keep your taste buds happy and your belly full. Begin by pressing the tofu for about 30 minutes to remove the excess moisture. 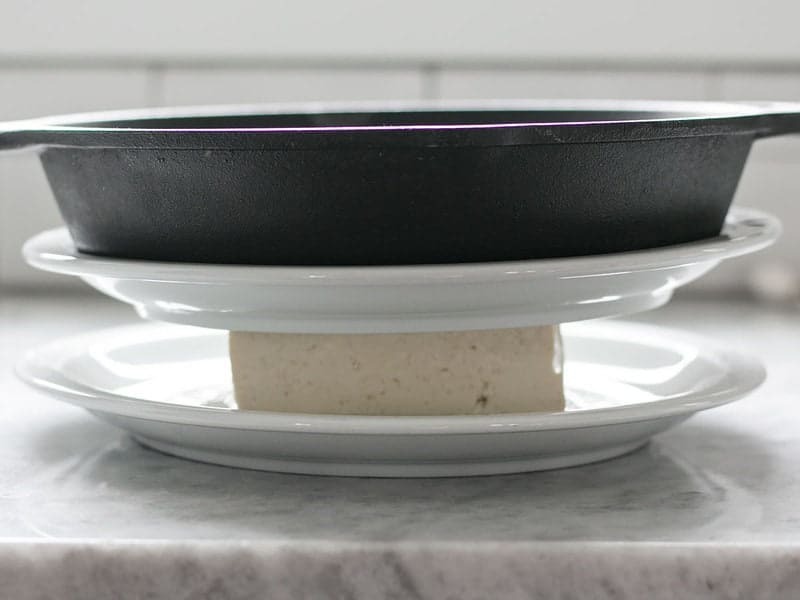 Place the block of tofu between two flat plates, rimmed baking sheets, or cutting boards and place something heavy on top, like a cast iron skillet or a pot full of water. If using cutting boards or something without a rim to hold in the water that seeps out, place paper towels or a clean dishcloth under the tofu to catch the liquid as it is expelled. While the tofu is pressing, begin the rice. Cook your rice according to the package directions, making sure to include salt. Once the rice has cooked, fluff it with a fork and then drizzle 1/2 Tbsp toasted sesame oil over top. Fold the oil into the rice, making sure not to stir too vigorously, then repeat with the second 1/2 Tbsp of sesame oil. The rice should now have a wonderful toasty nutty flavor and aroma. Set the rice aside. 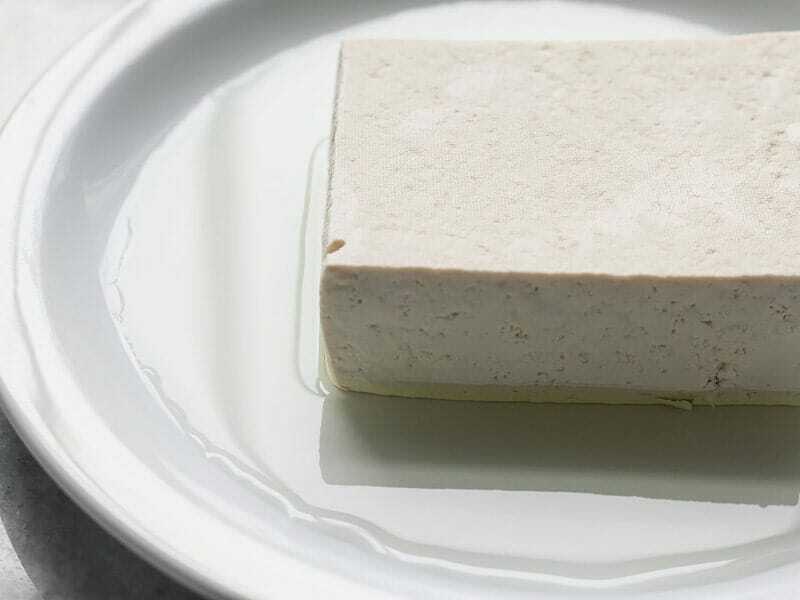 Once the tofu has pressed, pour off the excess liquid. Slice the block of tofu into 16 triangles (I cut the thickness of the block in half, then cut the stacked halves into quarters, and each piece into two triangles). Place the tofu pieces in a shallow bowl or dish. 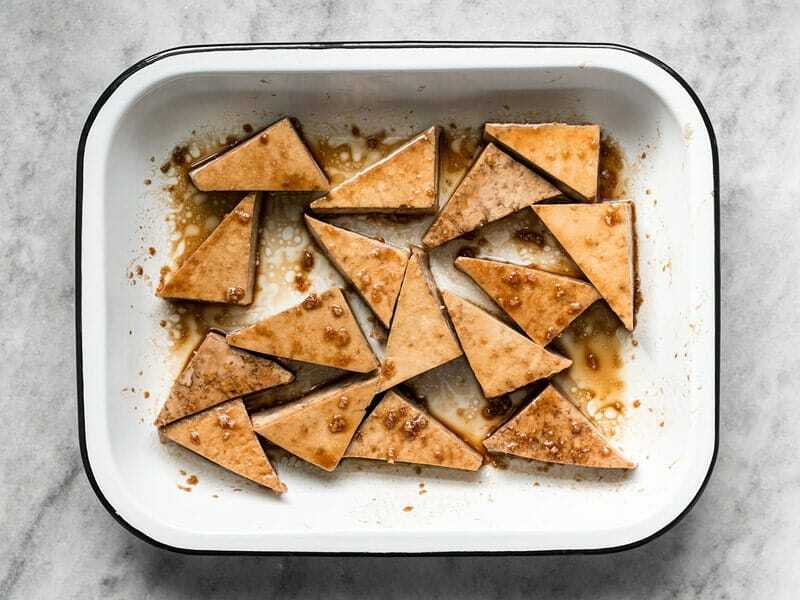 In a small bowl, stir together the ingredients for the tofu marinade: oil, soy sauce, minced garlic, and brown sugar. Pour the marinade over the tofu pieces and turn them all to make sure all sides are coated. 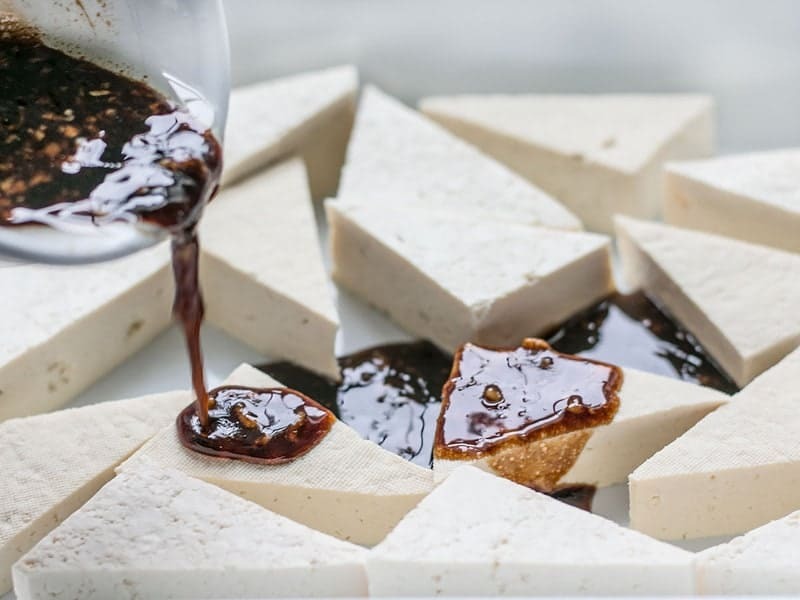 Allow the tofu to marinate for about 20 minutes, turning the pieces once or twice during that time. After 20 minutes, most of the marinade should be absorbed. While the tofu is marinating and the rice is cooking prepare the spicy peanut sauce. 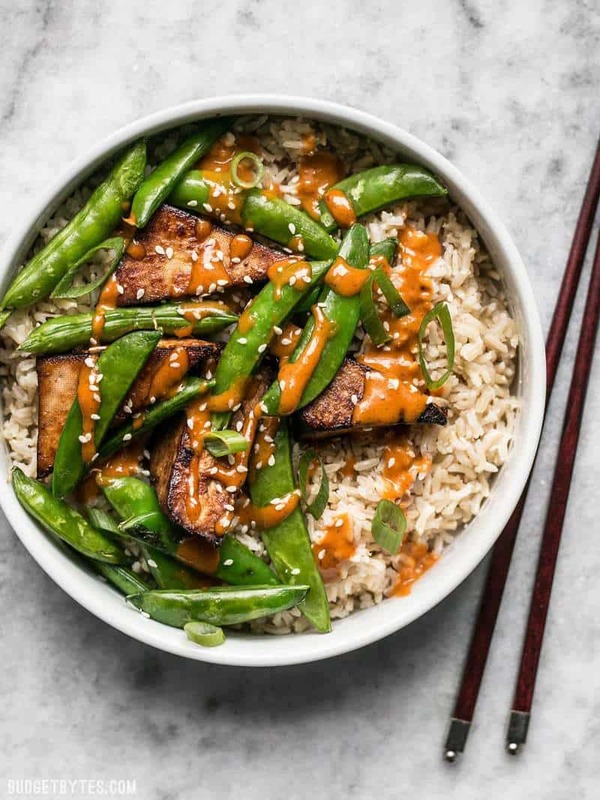 In a bowl stir together the peanut butter, sriracha, soy sauce, grated ginger, brown sugar, and enough hot water to create a smooth sauce (3-4 Tbsp). Set the sauce aside. Once the tofu has marinated, heat a large non-stick skillet over medium flame. Add just a splash of oil to the skillet (about 1 tsp) and swirl to coat the skillet. Add the tofu pieces and any remaining marinade, and cook on each side until deeply browned. Once the tofu pieces are browned, remove them from the skillet and add the snap peas. 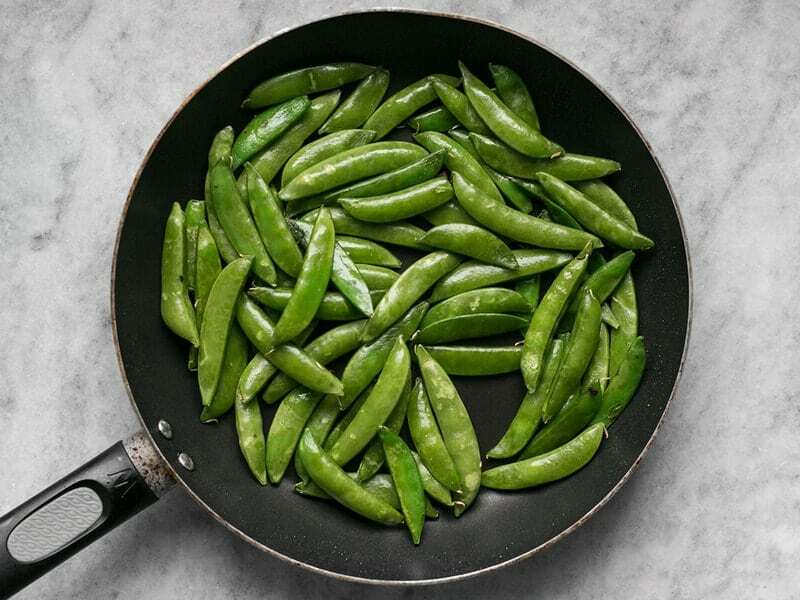 Quickly sauté the snap peas in the skillet until they turn bright green and are still crisp. You just want to remove the raw edge. Remove them from the skillet to prevent over cooking. To build the bowls, add about 1.5 cups sesame rice to each bowl and then top with 1/4 of the tofu pieces and snap peas. Drizzle spicy peanut sauce over each bowl and then sprinkle sliced green onions and sesame seeds over each. * Use a light flavored oil like canola, grape seed, light olive, or an untoasted sesame oil. **I used a brown basmati rice but you can use any variety that you like. Just be sure to follow the package instructions for the correct cooking time and water to rice ratio. ***If you can't find snap peas at a decent price, you can use broccoli florets in their place. While the tofu is pressing begin cooking your rice, especially if you’re using a brown rice like I did, because that will take at least 30 minutes. 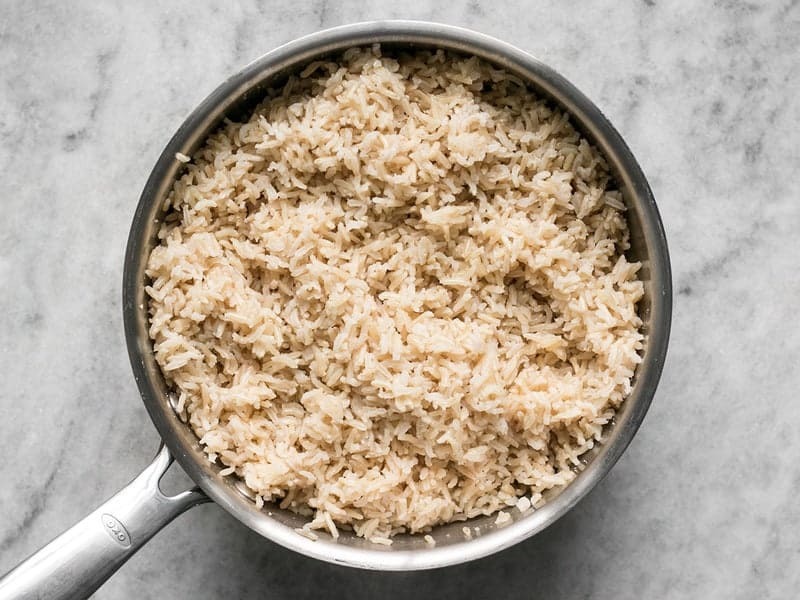 You can use whatever type of rice you want, just make sure to follow the package directions for the correct amount of water to use for 2 cups dry rice and the correct cooking time. Also make sure to include some salt to help the sesame flavor pop later. After your rice has cooked, sprinkle about 1/2 Tbsp toasted sesame oil over the rice and gently fold it into the rice. Then repeat with the second 1/2 Tbsp sesame oil. Set the seasoned rice aside. 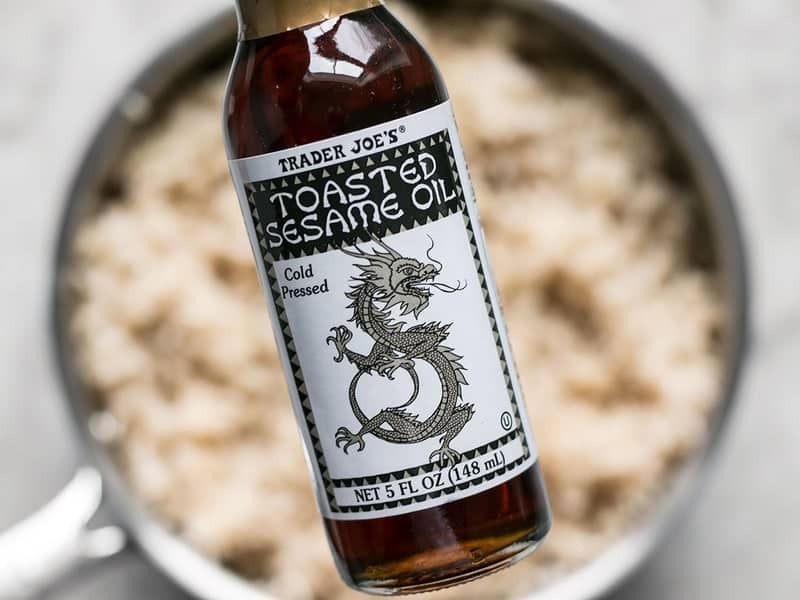 Make sure to use toasted sesame oil and not just regular sesame oil because the toasted sesame oil has a MUCH stronger nutty flavor. If the label doesn’t say “toasted” you can tell by the color of the oil. Toasted sesame oil is a dark brown color, whereas regular sesame oil is a light straw color. While the rice is cooking your tofu will probably be ready to start marinating. Cut the pressed tofu block into 16 triangles (I cut the thickness of the block in half, then cut the stacked halves into quarters, and each rectangle into two triangles). In a small bowl stir together 1 Tbsp light flavored oil, 2 Tbsp soy sauce, 1 clove of garlic (minced), and 1 Tbsp brown sugar. 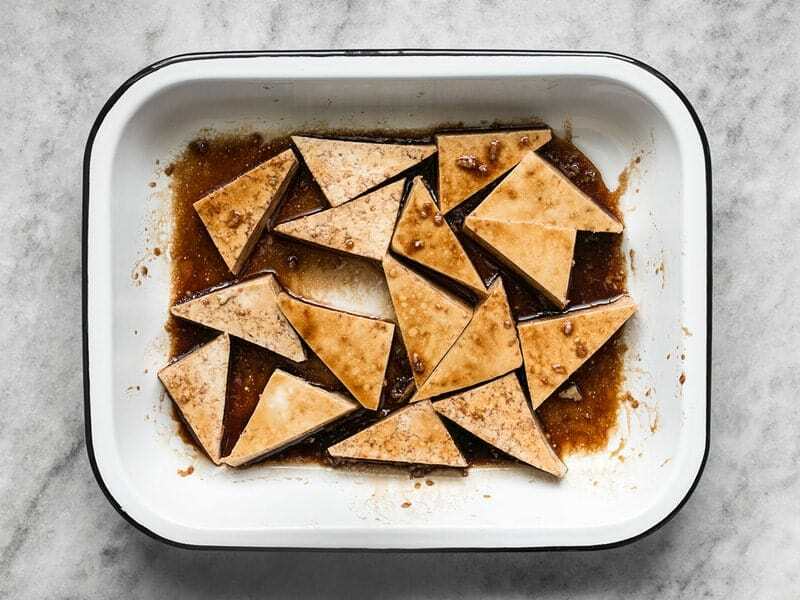 Place the tofu triangles in a shallow dish and pour the marinade over top. Make sure both sides of the tofu pieces are coated in marinade. Let it marinate for about 20 minutes, turning the pieces once or twice during that time. 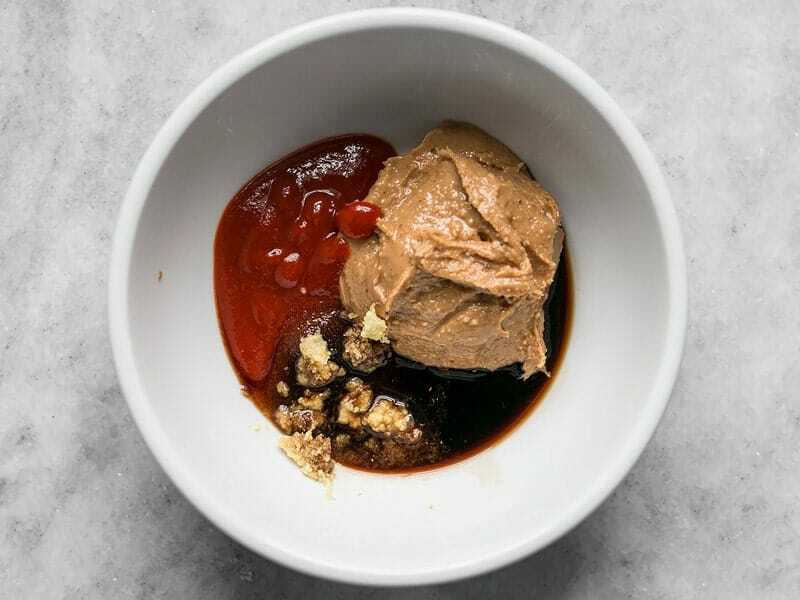 While the tofu is marinating, make the spicy peanut sauce. 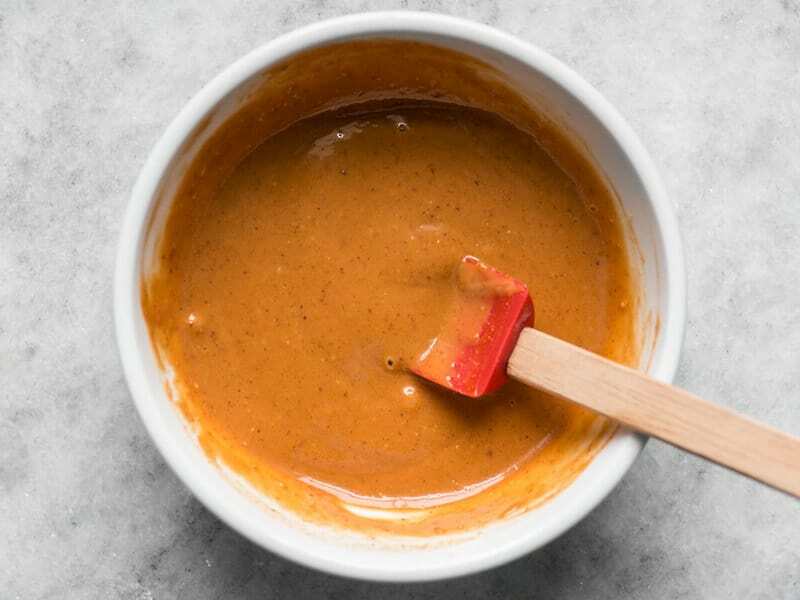 In a bowl stir together 1/4 cup natural style cream peanut butter, 1 Tbsp sriracha, 1 tsp soy sauce, 1 tsp grated fresh ginger, 1 tsp brown sugar, and about 3-4 Tbsp hot water or enough to make a smooth sauce that is thin enough to drizzle. Once the sauce is mixed together, set it aside. You can always start with just a small amount of sriracha and add more to your liking. After about 20 minutes the tofu will have absorbed most of the marinade. Now it’s time to cook the tofu. I used a non-stick skillet because the sugar in the marinade will make it more likely to stick. I only added a splash of oil to the skillet since the marinade already has some in it. Heat the skillet over medium, then add the tofu pieces and any remaining marinade. Cook the tofu pieces on each side until browned and caramelized on the edges. Remove the tofu from the skillet, then add 1/2 lb. snap peas. Sauté the snap peas very briefly, or just until they turn bright green. I didn’t even add any extra oil to the skillet, there was enough residual oil to make these peas nice and glossy. Once the peas are just barely cooked, remove them from the skillet. 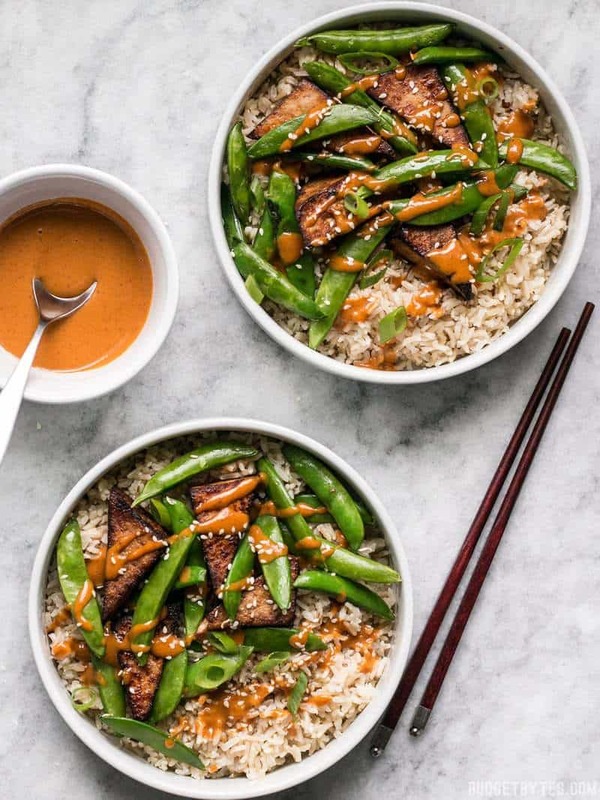 Finally, to build the bowls, place about 1.5 cups of the sesame rice in each bowl and top with 1/4 of the tofu pieces and snap peas. Drizzle the peanut sauce over top, then sprinkle sliced green onions and sesame seeds over everything. Can you publish the nutrition facts along with the recipes? And is there any way to get the nutrition information for the recipes on the web site? Unfortunately I do not have the nutrition information. You can read more about why I do not publish nutrition info in my FAQ’s (first question). This was so good!! 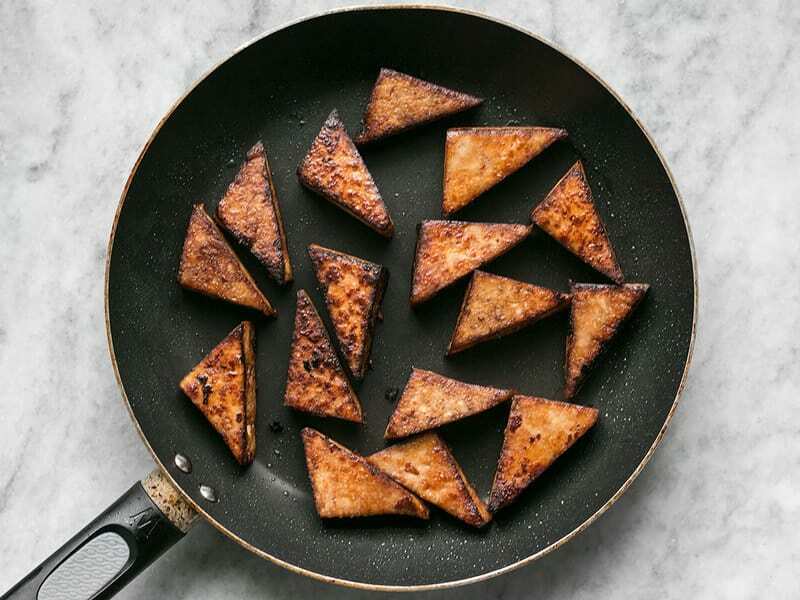 I LOVE the idea of slicing the tofu into triangles, it made the dish look so pretty! I’m usually not the biggest fan of brown rice, but I’m glad I used it for this, because I don’t think white rice would hold up as well with all the flavors. I followed another reviewer’s advice, and doubled the spicy peanut sauce, but I like my food particularly saucy, I think most people would be fine with just following the recipe. I also used broccoli instead of snap peas and it turned out great! Could I substitute almond butter for peanut butter for the sauce? You can, but it will change the flavor quite a bit. My tofu didn’t want to cooperate, it was a brick of shelf stable firm tofu that was nearly half crumbly from the start and kept falling apart at every step so a bunch of my pieces got pretty small but it tasted really good regardless all cooked up and nicely browned. I didn’t have very many sugar snap peas but had a 1lb bag of frozen broccoli so after removing the cooked tofu from the pan, I added a little oil/water/soy/garlic/salt and pepper and put the lid on it for 5-6min. Poured out most of the water, added the sugar snap peas and fried it a bit till a little softened , tasted it and added a little more salt and garlic. My hubby specifically asked for my authentic Thai spicy peanut sauce (~3TBS maesri’s red curry paste (more if you like it really spicy), 3/4 cup natural PB, 3/4 cup sugar, 2TBS vinegar, 1 can of coconut milk, 1/2 TBS salt, 1/2 cup water – all cooked on the stove on med for a little while till it thickens, stirring constantly—it freezes well or stores in the fridge for quite sometime :) ) so I made that while the rice was cooking instead of the one for this recipe. Was out of normal rice and brown rice so I used sticky rice and added the sesame oil like it callled for. Overall, was a bit time consuming but I’d say totally worth it. Gunna use a different tofu next time but it still worked out :) and was very tasty! Family was very pleased and I’m a little bummed to find the only leftovers were the rice and peanut sauce since I’d love to have leftovers of it all. (I made the max amount of rice my little rice maker can make for only 3 people and that peanut sauce always makes a bit but it’s good so that’s ok. . Maybe I’ll thin out the sauce w water and turn it into the sauce for Thai chicken pizza or something..
Do you have any tips for storing leftovers of the sauce? I put it in the fridge, and it got really thick. i hate to waste it. This is one of my favorites of yours!! If you warm it up it should thin out again, or you could stir in a teaspoon or so of hot water to help thin it out. :) Other than that, I don’t think there is anything else you could do to prolong its refrigerator life. This came out so tasty! I loved every component in this dish. The peanut sauce is amazing. I can see myself making this over and over again. Delicious! This is my absolute favourite recipe at the moment! I make it quite regularly. My only suggestion is to double the sauce, and double the tofu. Wow I loved the peanut sauce! I have made other spicy peanut sauces but this topped them all. The tofu was tasty too. As much as I wanted to love this recipe, I just couldn’t. It was a bit complicated and time consuming, and the peanut sauce just didn’t settle well with me. The tofu, however, was delicious. Next time I think I will double that marinade to use in place of the peanut sauce, with siracha, of course. Is it possible to substitute the pb for almond butter and the rice for quinoa? Yes, it is possible, just be aware that the end product will taste quite different.